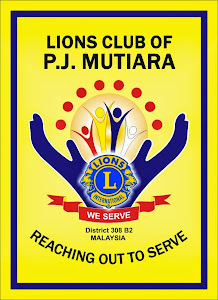 ANOTHER PROJECT TO BE JOINTLY CONDUCTED WITH CLUB BRANCH PJ CENTRAL. President Vincent, PP Irene, PP Yvonne and PP Jessie with 12 CB PJC members led by President Laticia assembled at Ibu Pejabat Polis Kontinjen Kuala Lumpur, Jalan Hang Tuah, Kuala Lumpur to officially meet with YB DSP Foo Chek Seng to hand over 35 sets Lions Work with PDRM specially designed t-shirts and further discuss on the 1st project with the Taekwondo PDRM and the Traditional Medicine team under Lion Dr. Ng Poh Min and other Health related screening and Blood Donation. YB DSP Foo proposed to have this event at a community hall at JKKK Kuala Ampang either 22 Oct or 26 Nov subject to availability to be confirmed by PDRM and Lion Steven Wong will keep members posted. from 1-3 pm after a sumptuous lunch. 16/9/2017 Peace Poster Contest "The Future of Peace"
Also known as Pusat Jagaan Saresu, situated at 35 Jalan 1/8 Bandar Rinching, 43500 Semenyih, spearheaded by Club Branch PJ Central, PP Yvonne and PP Irene together with PJC OC Janet, President Laticia with her friend from Shenzen, members Connie & Grace contributed majority foodstuff ranging from biscuits, bread, rice, sugar, salt, cooking oil, canned food, rice vermicelli (mee hoon), dried noodles and non-perishables included detergent during their visit to the home at 4 pm. Greeted by caretaker and explained that the home has 30 odd inmates aged 55 and above with majority being handicapped. Vote of special thanks to Lion Gaga who sourced most of the items and Lion Janet’s brother who also contributed a fair portion too.